This gorgeous before and after was sent to us by Elise Dickson. 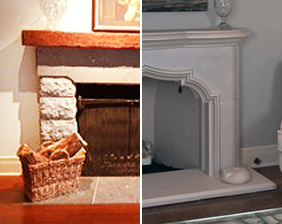 She updated her plain gas fireplace with our elegant Stamford in cream and accented her beautiful new addition with our optional raised hearth. This order presented a challenge of needing a quick turn around time, (just 3 weeks!) but we were able to make it work and Elise sharing these before and after pictures with us makes it all worth it! 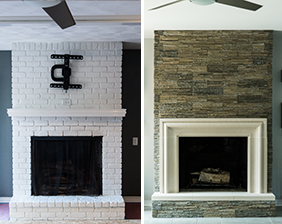 We love the fireplace [Stamford] & how great it looks in our spec home! Thank you so much for rushing it to us & producing such a quality piece. Every person we communicated with at OWSwas so friendly, helpful & efficient. Five star service for sure! We will definitely work with you in the future! Thanks Again!